How many people have used the ‘Restricted list’, thinking their newly ‘friended’ boss will not see all of those disparaging comments made about work, only to find out later that Facebook removed those restrictions without permission? As sites like Reasonstohate.com continue to expose the dangers of posting publicly, Facebook seems to be in a never-ending attempt to reassure the public that they take privacy seriously. In their latest attempt, they’ve taken a page out of Google +’s book and implemented easier to use “lists”, which are similar to circles. Lists allow Facebook users some granular control over their posts, allowing work friends to see work posts, and neighbors to see neighbor posts, and prevent those worlds for colliding with each other. Unfortunately, there’s a major defect in the way one of these lists work. When you send a person a friend request on Facebook, you’re also given the opportunity to add that person to your lists, at the same time. That means you can invite a person to be your friend, and classify them as a friend, neighbor, or even add them to the restricted list. What happens when I add someone to the Restricted list? When you add someone to your Restricted list, they will only be able to see yourPublic content or posts of yours that you tag them in. So if you put your boss on your Restricted list, post a photo and choose Friends as the audience, your boss (and anyone else on Restricted) won’t see that photo. However, if you add a tag of your boss to the photo, we’ll let them know they’re in it. If someone else tries to tag your boss in one of your photos, you’ll get to approve this tag from your pending posts. When you send someone a friend request, you can also add them to multiple lists at the same time. 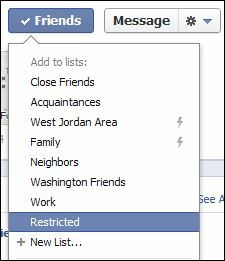 For instance, when I add a neighbor I don’t know real well, I might add them to “Neighbors” and also to “Restricted”. This allows me to be friends with them and see their posts, but they’ll only see a limited amount of my posts instead of some of the more personal posts I’ve made. Unfortunately, as soon as that person accepts my friend request, they’re automatically removed from the Restricted by Facebook. The other groups are left in place, but the Restricted group is removed. This unfortunately means that any new ‘Restricted’ friends have access to my whole Facebook history until I remember to go and re-add them to the Restricted list. Go ahead! Try it. I’m unsure if this is intentional functionality (If it is, it’s horrifically stupid) or if it’s a software bug. Either way, it’s a major limitation on the Restricted functionality. Facebook touts it as a way to keep private things private, but they automatically remove that barrier under conditions not made clear in their documentation. How many people have used the Restricted list, thinking their newly added boss will not see all of those disparaging comments made about work? This entry was posted in Technology. on March 13, 2012 by I'm a Super .com. If I restrict someone on my friends list, can people still search my friends and see that they are a friend of mine?